While we wait for the laneway to be completed, we are working hard to make sure we have all the decorative components ready to install when the time is right. We are challenged by the small space, of course, but we know we can have a smart looking home — a jewel box of a house — with lots of special decorating touches. 1. Don’t be afraid of drama. 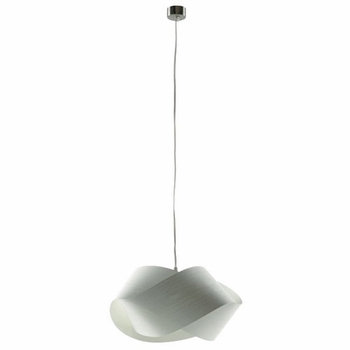 We are counting on our lighting to add a real punch to our spaces. 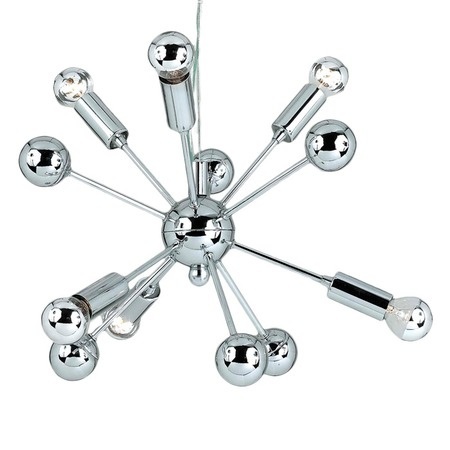 Already on hand are the sputnik light for the bedroom. I’ve always liked the idea of a chandelier hanging over the end of the bed — but we needed one that would fit in with our mid-century modern decor. 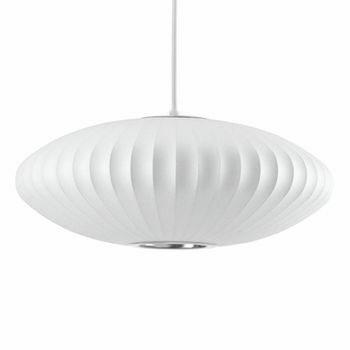 The kitchen will have a saucer lamp, another icon of mid-century modern. and of course, there’s the nut lamp to hang over the garden door. This is a no-brainer as far as I’m concerned. A lot of people like open shelves in their kitchens, and I can see their charm. But our kitchen is also our sitting room, so we are putting everything we can behind closed, walnut-clad doors. Including our appliances that would ordinarily sit out in the open, which we are putting in an appliance garage. Our designer has planned for built-in shelves along the wall beside the staircase. These will serve not only as the repository for books and family pictures, but also as a “landing strip” for our keys and the mail when we come in the door. We’ll put baskets or decorative boxes to hold them out of eyesight but close at hand. 7. Bring in as much natural light as possible. Another no-brainer. We are challenged in this regard by the slope of the lot that the home is built into — we have limited access for putting in windows. It worked out for us as we want our “quiet, dark” bedroom downstairs. Upstairs we put in windows wherever we could, a glass door out to the deck, and even a window between the upper cabinets and the counter. Our bed will have storage underneath, and we are putting in drawers in our bottom stairs in the hall, so we get this message loud and clear. We are also looking at how we can have storage put into an ottoman for our sitting room area. Good ideas all, read the whole article for more great suggestions. And stay tuned for more news on our decor! Posted in Laneway House, Small House, Uncategorized and tagged Decor, Lane Home, Laneway House, Small House, Small Style. Bookmark the permalink.